Which dinosaur has the longest neck? Which long neck dinosaur do you like best? Would you like to compare them? Find out who the long necked dinosaurs were with facts, pictures and information for kids. 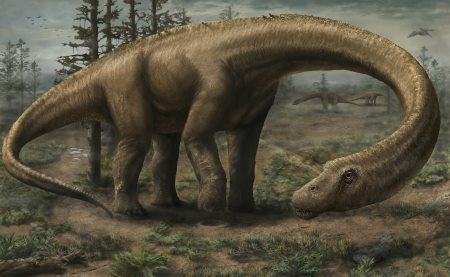 When we think of a dinosaurs with long necks then we are usually thinking of members of the (plant eating) sauropod classification of dinosaurs. They have long necks and tails, small heads and four thick legs. Let us take a look at some examples, and find out some dinosaur facts about them! Scientists say that the Dreadnoughtus is among the biggest land animals to walk the earth. Its head and neck length was around 12.2m (40ft) and its length from noe to tale was 26m (85ft). 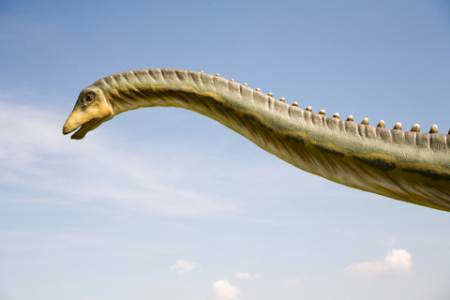 Brachiosaurus were were around 25 metres long (85 feet) in length and weighed 40 tons. They could reach up 9 metres high - the same as two double-decker buses stacked on top of each other. Diplodocus is thought to be the longest known dinosaur. The neck could reach over 6m (20ft) and its long tail had 80 vertebrae. In 2015 paleontologists from the University of Alberta discovered a new species of a long necked dinosaur from a skeleton found in China. Qijianglong (pronounced “CHI-jyang-lon") is about 15 metres long and lived about 160 million years ago in the Late Jurassic period. Although the neck was very long, the neck vertebrae were filled with air, making their necks lightweight. Most sauropods have necks about one third the length of their bodies. 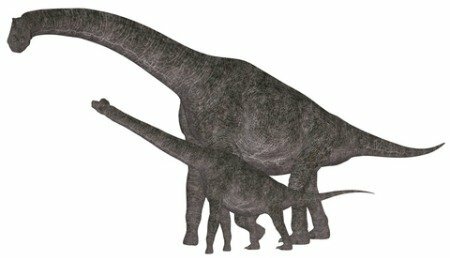 But Qijianglong belong to a species of dinosaur called Mamenchisauridae (part of the sauropod family). These are known for their extremely long necks sometimes measuring up to half the length of their bodies. It wasn't just on land that long necked creatures evolved. 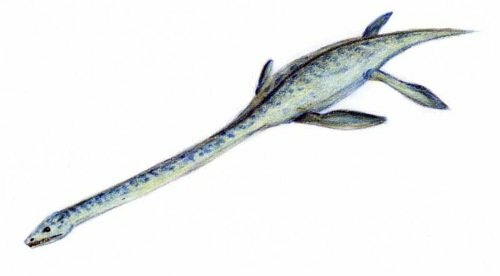 This swimming reptile is the Elasmosaurus. Their necks were so long they wouldn't have been able to lift more than its head above the water to breathe. Find out more about Elasmosaurus or about all the swimming reptiles. I hope that gives you some interesting long neck dinosaur facts!